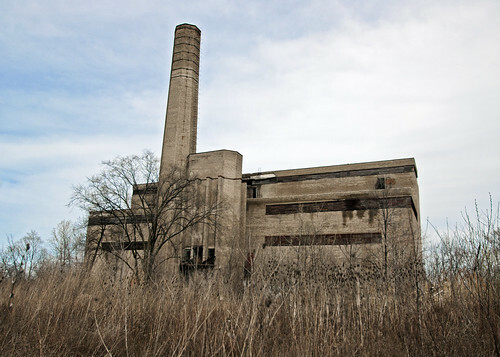 Photo: Power plant for what was originally the Ingalls-Shepard Forging Co. In 1910 seasoned manufacturing veterans F.A. Ingalls and Charles C. Shepard partnered to create the Ingalls-Shepard Forging Co. in Harvey, Illinois. Ingalls took up the mantle of President and treasurer, while Shepard acted as Vice President. The company produced a wide range of parts for the burgeoning automobile industry and railroad companies. As the world delved into chaos during the War to End All Wars industrial manufacturers across the United States were pushed to the limits of their operating capacities to great profit. In 1920 the Wyman-Gordon Company out of Worcester, Massachusetts acquired the Ingalls-Shepard Forging Co. and rechristened it as the Ingalls-Shepard Division. The consolidation placed Ingalls as Vice President of Wyman-Gordon, but he would still maintain operational control over the Harvey factory. Photo (source): Logo from an advertisement for Wyman-Gordon with the Harvey plant on the right. The Roaring Twenties were a boon for the steel industry. The automobile, which had been a luxury item the previous decade, now entered the American mainstream as mass production made “horseless carriages” accessible to the general public. The automobile may have driven urban development outward, but new architectural technologies drove cities upwards. Skyscrapers demanded strong metal frameworks to withstand environmental punishment. New massive machines such as massive cranes and earth movers were needed to move materials. While skyscrapers penetrated the sky, aeronautic developments of the Great War brought with it the commercialization of airplane travel. Wyman-Gordon produced parts that serviced every one of these industries. At the outset of World War II all large US manufacturers devoted their efforts to defeating the Axis, which Wyman-Gordon used to their industrial advantage. US Army engineers kept on the heels of the front lines to dismantle superior German industrial technology and pass it on to American businesses such as Wyman-Gordon. The Wyman-Gordon company claims to have produced more single parts for the war effort than any of its entirety of its competitors in the industry. Photo: The equipment is completely rusted over. Innovation in the aeronautics industry drove Wyman-Gordon business for the next few decades. By the 1960’s the Wyman-Gordon company was recognized as the leading innovator in forging and titanium technologies. The US government contracted with Wyman-Gordon to create parts for the B-52 Stratofortress, the secret SR-71 spy plane, F-14 Tomcat and F-15 Eagle fighter jets. In the civilian market the company produced parts for hundreds of other aircraft. In the 1980’s, however, declining defense expenditures, sagging commercial airline development, and international competition put manufacturers like Wyman-Gordon into commercial distress. In order to stay operational Wyman-Gordon decided to shutter the Ingalls-Shepard Division in Harvey. The announcement proved devastating as the community had already endured the recent closing of three other major manufacturing employers. The company tried in vain to sell the 780,000 sq. foot facility for over six months, but was unable to find a buyer. The manufacturing of diesel engine crankshafts was moved to the company’s Danville, Illinois plant and special manufacturing to Jackson, Michigan. In 1986 the closing of the Ingalls-Shepard Division took with it 350 jobs from Harvey. Photo: Massive storage areas several stories tall. Plans for redevelopment of the 47-acre industrial site revolve around tapping into Harvey’s geographic advantages in transportation. The southern Chicago suburb has three expressways, four national highways, four freight railroads and the Chicago Metra lines running through it. Although a majority of the Ingalls-Shepard Division buildings have been demolished, the Environmental Protection Agency has listed the location as a brownfield in need of cleanup before development can continue. It would seem logical that Wyman-Gordon would be on the hook for cleaning up the site, but that is not the case. With one of the highest unemployment rates in the Chicago area and lowest average household income Harvey cannot afford the up front costs for assessing the property. Compounding an already bad situation is the fact that the total cost of cleanup may exceed the market value of the land once remediated. All that remains of the Ingalls-Shepard Division is the power plant and a still occupied large building across the street from it. Fences border the entire perimeter of the power plant, but are pried wide open in several areas. The building is about four or fives stories high with an even higher smokestack affixed to the rear. On the inside the factory has been scrapped and everything metal has the patina of decay. The interchangeable fixtures of the heavy machinery are all missing, but the core pieces remain. Coal hoppers, generators, and some dynamos encased in a heavy layer of rust remain. Steel walkways crisscrossing the upper portions are missing large sections and appear quite unsafe for even the most seasoned urban explorer to traverse. Photo: Some of the steel walkways have large sections missing. The Ingalls-Shepard Division power plant is a monument to the prosperity once generated in the Harvey. The power plant will most likely loom over the community until the federal government steps in with enough money to remediate the land. In the long run the tax-payers will end up paying for Wyman-Gordon’s mess. There is still one thing that I have been unable to pin down about this location though. Why was the power plant spared from demolition when the rest of the factory came down? If you have an answer, please leave it in the comments. ASME (PDF) – Fascinating brochure detailing how US troops captured superior German forging technology during World War II and passed it on to Wyman-Gordon. Chicago Tribune – 1985 article announcing Wyman-Gordon plans to sell the Ingalls-Shepard Division plant. Chicago Tribune – 1986 article announcing 350 layoffs from the Wyman-Gordon plant. 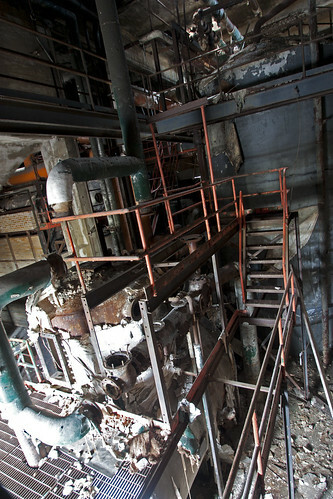 Chicago Tribune – 2010 article on the EPA cleanup of the Wyman-Gordon plant. CNT (PDF) – Document describing a collaborative effort between Harvey and Dixmoor authorities to remediate the site. EPA – Facility Detail Report by the Environmental Protection Agency. EPA – 1997 Brownfield Assessment Pilot by the Environmental Protection Agency. Flickr – My Wyman-Gordon photo set. Google – Wyman-Gordon company timeline. Google Books – 1910 Railway Age Gazette article mentions construction of the Ingalls-Shepard Forging Co. building in Harvey, which was acquired in 1919 by Wyman-Gordon. Google Books – 1917 Electrical Review succinctly explains why electrical furnaces are better than gas fueled ones. Google Books – 1920 Machinery mention on the merger of Ingalls-Shepard Forging Co. and Wyman-Gordon. Google Books – 1920 Electrical World mention of an electric heat furnace used at the Ingalls-Shepard Forging Co.
Google Books – 1922 Wyman-Gordon advertisement from the Society of Automotive Engineers that has the Harvey plant pictured. 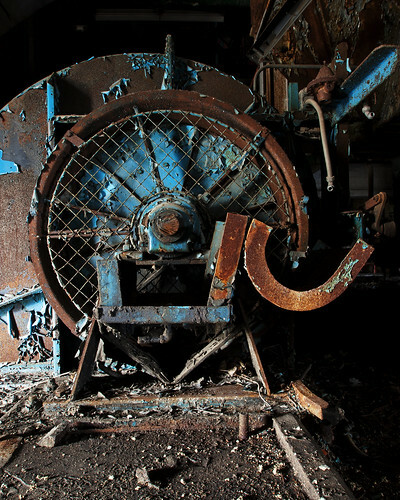 Flickr – Flickr user reallyboring’s set of the Wyman-Gordon plant. Funding Universe – Wyman-Gordon company history. 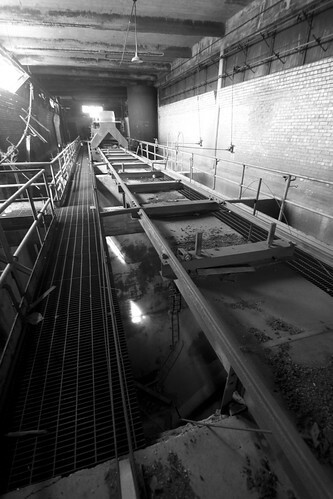 IQMesothelioma – Law firm notice of asbestos and mesothelioma health risks for former workers at the plant. I worked for a security firm in the 1980s not long after they shuttered Wyman-Gordon. We had a perimeter we had to walk, carrying Detex clocks with keys at various stations we had to punch along the way…proof I suppose that we were doing our job. Hence, I got to see a LOT of that plant. In fact, I got to see pretty much all of it. They didn’t need the Detex stuff with me; I was a pretty avid caver back then and wandering through W-G was like your average cave trip, especially the steam tunnel that ran beneath the street from the power plant to the main facility…urban exploration indeed! It was an interesting place any time, with all sorts of areas with different purposes and I used to enjoy picturing what might have happened in each room. The main plant floor had crates and crates of crankshafts that looked like they could be dropped right into engines. The maintenance shed still had all of its tools in place, like they could start back up to work at any moment. They did in fact have a skeleton crew there for a while at first till even they were let go…when they were released, they gave me their hard hats because they knew I was a caver and figured I could use them. I ended up donating them to a cave club I belonged to at the time. I have a lot of memories of the place and it must have been important to be as I ended up writing a poem about it at the time, something evocative about a dying city. Perhaps I should dig it out. It was very easy for me to imagine the thousands of people coming to and from work there every day, and sadly, even easier for me to wonder just how those people were getting along without their jobs. Some memorable moments: sitting in the guard shack back in June 87 and watching the railroad crossing arms quiver violently on what was a very calm day, and finding out later that evening that there had been an earthquake…walking along the fenceline and seeing where the neighbors had set copper wire snares for rabbits…having to put out a fire one afternoon after a work crew had been out cutting metal with a torch and hadn’t paid very close attention to where their sparks were landing…walking the steam tunnel during the winter and viewing the salt stalactites that grew up to a foot in length when Harvey over-salted Wood street…very cool! I would imagine if one could still access the old steam plant that the tunnel would still be accessible, but there you go. “This photo taken on the former Grand Trunk Western, now (I think) CN right-of-way. It’s really immaterial, but although close to Dixmoor, this location may actually be Harvey, IL. The smoke stack in the right side background appears to be that from the boiler house of the old Wyman-Gordon Company (Ingalls Shepard Division). I worked at this bustling plant for two summers in the 60’s while in college. They made massive forgings 24-hrs./day including crankshafts of all sizes, the landing gear for the biggest jets and also high speed turbine blades… … The former industry has a colorful history as does the railroad. When I worked for Republic Steel in the late 60’s to the 90’s in Chicago, Wyman Gordon was one of our largest customers for our bar stock. The only structure remaining today is the old power house. At least the name Ingalls today is survived by Ingalls Memorial Hospital in Harvey. As for some specific memories of Wyman-Gordon, here are some. •	If you were hired by W-G, you spent the whole day at Ingalls Hospital getting a complete physical which was real comprehensive. •	All engineering drawings were done in ink on a wax type cloth-paper. Using this media requires a special learned skill which I was never good at. Some draftsmen were very good at it and their work was very beautiful indeed. •	When I worked in the shops the next year, noise was very prominent. There were times I went home and would hear ringing in my ears. There was no requirement at the time to wear hearing protection. I wonder how much my experiences then has affected my hearing today. •	Some of the oldest seniority workers were on piece work making good money for what they produced. These guys would be found working through their break periods to maximize their incentive pay. •	In the shops, one would normally have two 10 or 15 minute breaks in addition to their lunch period. When the outside temperatures got to be over 90-deg., you would get an additional break period for the morning and the afternoon (4-total). These were welcome on the very hot days. •	On the hottest furnaces, sometimes when loading them the heat was so intense that metal objects inside your pockets, like coins, would heat up from the radiant heat and actually could burn you. •	They made massive sized crankshafts, some that were like 8-ft. long. In Engineering, I remember them designing a crankshaft so large that it was made in sections and welded together. •	W-G had hammering drop forges (very loud), but also slow moving hydraulic press forges with pressures of (if I recall) 35,000 tons pressure on the largest. •	My last day of work in the summer before returning back to school I managed to roll a steel cart loaded with plates over my foot. My steel toed shoes protected my toes, but it went onto my unprotected metatarsal. And stupid me, I never went to their First Aid. There was pain for almost a year on my foot which eventually went away. I am sorry to see good paying industry jobs such as this one die out like they have. Back in the day everyone referred to this industry as “smokestack industry. Today they refer to it as “rust belt industry,” a not too nice term for something that made our country so great. There is another Wyman-Gordon forging plant sitting abandoned in the West side of Champaign Illinois off of Springfield Avenue. John, I did not know that (plant in Champaign). And when you say “plant,” I assume you mean “plant” and not a satellite office building type place. Incidentally, Wyman-Gordon had another major facility at the time in Worcester, MA. I think I mentioned that Harvey had a 35K ton press, well Worcester had a 75K ton press… talk about massive. Not demolished? Asbestos abatement. Almost every pipe, furnace and hot surface is blanketed in it. It’s falling off and lies in piles up to 2 feet deep in places. Update: in mid-2013, scrappers made off with all the steel walkways. My Fathers Dad and Mom worked there way back when and its very fresh in their minds. Great stories. Many people feel these old chimneys are landmarks to guide people to their town. I worked there for 25 years. I worked from 1963 til close down in 87. Worked in the steel cutting department and ran the magnetic cranes in the steel yard for almost all my time there. Really liked my job and was sad to go. My father Henry Voss worked there until they closed.